Pacific Gas and Electric Co. says its program of shutting off power in some areas during periods of high fire danger would not have applied to a major electrical transmission line located at the site where Butte County's deadly Camp Fire was first reported last week. Attention was drawn to the 115-kilovolt Caribou-Palermo line's possible role in the fire by a PG&E report about an outage on the line at virtually the same time and place the blaze was reported. The fire broke out early Nov. 8 after more than 24 hours of PG&E advisories that it might shut off power in some parts of its service area -- including Paradise, Magalia and several other communities in Butte County -- because of forecasts of extreme fire danger due to high winds, low humidity and critically dry vegetation. The "public safety power shutoff" advisories were canceled about nine hours after the Camp Fire started "as weather conditions did not warrant this safety measure." Now, PG&E says that even if conditions had prompted it to turn off power in some areas, the Caribou-Palermo line that's been implicated in igniting the fire would not have been included in the shutdown. That's because the company's shutoff program involves only lower-voltage distribution lines that carry power from the transmission system to customers. PG&E says shutting down the higher-voltage transmission lines would be a more complex process affecting customers over a wide area and requiring co-ordination with the California Independent System Operator, the agency managing the state’s power grid. PG&E spokeswoman Deanna Contreras said in an email that the grid agency, known as CAISO, allows utilities to shut down transmission lines during emergencies -- for instance, at the request of Cal Fire to protect crews working near lines. "However, in light of the potential public safety issues resulting from de-energizing higher voltage transmission lines, including the potential to impact millions of people and create larger system stability issues for the grid, PG&E has not extended the (shutoff) program to transmission lines that operate at 115kV or above,” Contreras said. The California Public Utilities Commission, which regulates PG&E, laid out guidelines earlier this year for companies considering power shutdowns during periods of extreme fire danger. The rules focus on how much notice utilities must give before a shutdown and require a post-shutdown report. But they give the companies sole discretion about what facilities they turn off and when -- with the caveat that regulators may review their shutdowns. "The utilities ... can de-energize any facility they deem necessary for safety -- transmission, distribution, substation etc.," CPUC spokeswoman Terrie Prosper said in an email. The companies "must submit a report to the CPUC within 10 business days after a de-energization event explaining their decision to shut off power, the notice that was given to customers and community representatives, the number and types of customers affected, the steps they took to restore power, and any other mitigation provided by the utility," Prosper said. She added that the commission may "may take enforcement action if a utility's actions were unreasonable." San Diego Gas and Electric began initiating power shutdowns after catastrophic fires touched off by power lines in 2003 and 2007. In 2012, responding to a complaint from Disability Rights Advocates, which said SDG&E shutoffs violated the company's statutory obligation to provide a reliable power supply, the CPUC issued a decision requiring the company to issue advance warning of shutdowns. In the wake of last year's Northern California fire siege, ignited in at least 16 places by PG&E power lines that failed or were knocked down during windy, bone-dry weather, the CPUC extended its decision to all of the electrical utilities in the state. PG&E conducted its first public safety power shutdown on the evening of Oct. 14. The outage lasted more than a day in some locations and affected a total of about 60,000 customers in Napa, Sonoma and Lake counties and four counties in the Sierra foothills. In its subsequent report to the CPUC on the outages, the company said crews found 18 instances of wind-related damage to conductors and other equipment in areas where power had been turned off. What role power lines played in the start of the Camp Fire remains unknown. 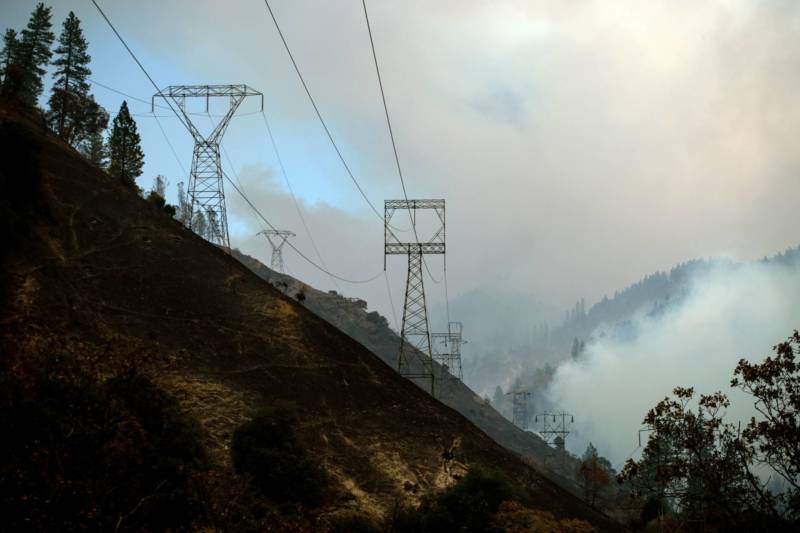 The fire was first called in about 6:30 a.m. on Nov. 8 from someone at PG&E’s Poe Dam, a hydroelectric generating station on the North Fork of the Feather River. The report indicated the fire was adjacent to nearby “high-tension power lines” that could present a hazard to responding firefighters. The first Cal Fire units on the scene arrived at 6:43 a.m. They identified the blazes's location, about a quarter-mile up a steep slope from the river, as underneath transmission lines. Late on Nov. 8, after the fire had ravaged the communities of Paradise, Magalia and Concow, PG&E notified the CPUC that it had experienced on outage on the Caribou-Palermo transmission line. The company told the commission that a later visual inspection had found unspecified damage to one of the line’s transmission towers. The company’s description of the tower's location, about a mile northeast of the resort of Pulga, appears to match the site where the fire was first reported. Cal Fire investigators are still probing the cause of the blaze, which killed scores of people and destroyed an estimated 10,000 homes. KQED's Ted Goldberg contributed to this report.